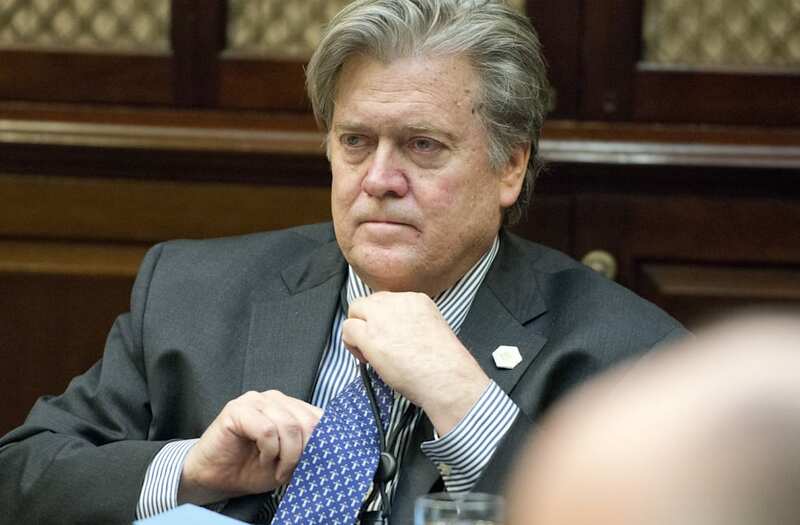 White House senior strategist Steve Bannon reportedly threatened to quit if he was removed as a member of the National Security Council's principals committee this week, a threat he apparently did not follow through on as his influence at the White House seems to be on the wane. According to a New York Times report, Bannon was elbowed out of the council Wednesday on the insistence of Lt. Gen. H.R. McMaster, the national security adviser who joined the administration after Michael Flynn resigned. An administration official told the Times that McMaster objected to having a political adviser sitting in on the most important national security decisions. Bannon, the official said, threatened to leave the White House altogether if he was removed, a characterization of events Bannon's allies have denied. Bannon himself has called it a "total lie" and "total nonsense." Bannon faces a loss in stature in the White House as the early days of President Donald Trump's administration have been marked by political crisis and failure to advance Trump's agenda. Bannon's removal from the committee was widely viewed as an indication he was being pushed out of the president's inner circle, increasingly replaced by first daughter Ivanka Trump, who now has an official titleand a West Wing office, and her husband, Jared Kushner, with his ever-expanding portfolio. Rather than an indication of his diminished power, sources close to Bannon told the Times, his departure from the council was a "natural evolution." They said he had only been put on the council to keep an eye on Flynn, who resigned following the revelations he discussed lifting sanctions against Moscow with the Russian ambassador, then mischaracterized his conversations to Vice President Mike Pence. Now that Flynn is gone, they said, Bannon no longer needed be on the council, although he has kept his security clearance. "Susan Rice operationalized the N.S.C. during the last administration," Bannon said in a statement, referring to President Barack Obama's national security adviser. "I was put on the N.S.C. with General Flynn to ensure that it was de-operationalized. General McMaster has returned the N.S.C. to its proper function." By law, the principals committee includes the president, vice president and secretaries of state, defense, energy and "the Secretaries and Under Secretaries of other executive departments and of the military departments, when appointed by the President by and with the advice and consent of the Senate, to serve at his pleasure." Trump's initial decision to reorganize the committee to include Bannon was met with intense backlash in line with the broader objections to Bannon's role as a close adviser to the president stemming from his background as the former executive director of Breitbart News, an outlet he once described as a "platform of the alt-right." His removal was celebrated by those who hope it portends a move to a more professional national security team, as replacing Flynn with McMaster had been. It "is a positive step by Gen. McMaster to gain control over a body that was being politicized by Bannon's involvement," said Rep. Adam Schiff of California, the ranking Democrat on the House Permanent Select Committee on Intelligence said in a statement. "Lacking a strong background in national security and with a long history of peddling racist and inflammatory conspiracy theories, Bannon should have never been placed on the principals committee to begin with, let alone given any role in the White House." Wait, Why Is Steve Bannon Off the National Security Council?